Twice before in this column space, we have spotlighted the life and death of one of Pekin’s co-founders, Major Isaac Perkins, who was killed in the battle known as Stillman’s Run on May 14, 1832, during the Black Hawk War. We first looked at Perkins in a column published on Aug. 3, 2013, and again examined Stillman’s Run in a column published last summer, on July 25, 2015. But despite great progress in reconstructing Isaac Perkins’ life and ancestry, one question remained unanswered: Why did the standard histories of Tazewell County and Pekin refer to him as “Major” Isaac Perkins when he had only the rank of “Private” during his Illinois State Militia service in the Black Hawk War? Prior to Pipkins’ discovery, the best guess is that Perkins had held the rank of Major during earlier militia service. That’s exactly what the information from the State Archives shows. Pipkins also found some records that document another detail of her ancestor’s life mentioned in old Tazewell County histories – namely, that Perkins had served as Tazewell County Recorder of Deeds. Here’s a chance to read again one of our old Local History Room columns, first published in August 2013 before the launch of this blog . . . Among the pioneer settlers of Tazewell County was a man named Isaac Perkins. Though little remembered today, he was a figure not only in the county’s early history but also played a role in the founding of Pekin and took part in an important formative event in Illinois history. In this column, we will sketch Perkins’ life with the help of publications in the library’s Local History Room collection and materials supplied by Cathie Butler Pipkins of Olympia, Wash., a descendant of Isaac Perkins’ youngest son James. Isaac Perkins was born in 1795 in Livingston County, Kentucky, one of the seven children of Solomon and Elizabeth (Miller) Perkins. Solomon was born in western North Carolina in the 1750s and died around 1809 in southern Illinois. He is mentioned in early Illinois history as the first permanent settler in the Cave-in-the-Rock area of southern Illinois in the early 1800s. On Nov. 7, 1813, in Pope County, Ill., Isaac, then 18 years old, married Jane Barker (1797-1862), daughter of Lewis Barker, a neighbor of Solomon Perkins who, like Solomon, had been born in North Carolina and settled in Livingston County, Kentucky, before coming to Cave-in-the-Rock. During the War of 1812, Barker had served as a captain in the Wabash Territory Illinois Militia, and in 1818 he was elected the first Illinois state senator for Pope County. In that year, Barker’s son-in-law Isaac Perkins served as a Justice of the Peace in Franklin County, Illinois. Isaac and his wife Jane had eight children. In the 1820s, Solomon Perkins’ sons Elisha and Isaac moved to the future Tazewell County, arriving about a year after pioneer settler Nathan Dillon. Elisha’s wife Susannah was a sister of Isaac’s wife Jane. Chapman elsewhere mentions the appointment of Isaac Perkins as a county election judge for Sand Prairie precinct, and that Isaac’s brother Elisha built one of the first mills in Sand Prairie Township. It was Elisha who laid out the now vanished town of Circleville in the northeast corner of the township. Upon their arrival in Sand Prairie, Isaac and Elisha had built crude cabins in Section 1. Elisha remained in that location, while Isaac acquired extensive land not only in Sand Prairie but also at the future site of Pekin. In 1825, Isaac served as a Justice of the Peace for Peoria County, when then included the territory that would become Tazewell County. After the creation of Tazewell in 1827, Isaac was the county’s first Recorder of Deed, and the very first legal document in the Recorder’s office, dated July 6, 1827, bears his name (A digital image of this document may be seen at http://www.tcghs.org/photo0500.htm). In 1829, Isaac was one of the four original plat deed owners of Pekin. The other three plat owners were Gideon Hawley, William Haines and Nathan Cromwell. It was Cromwell’s wife Ann Eliza who chose the name “Pekin” for the Town Site on the Illinois River that the four men had platted out. Ann Eliza was a sister of Isaac Perkins’ wife Jane Barker and Elisha Perkins’ wife Susannah Barker. Nathan Cromwell, reportedly with the assistance of his wife Ann Eliza, named the city streets in the original town of Pekin after the wives and daughters of the first settlers here. Susannah Street was named for Elisha Perkins’ wife (although in his list of Pekin’s feminine-named streets, Ben C. Allensworth’s 1905 Tazewell County history garbled Isaac with his brother Elisha). The early publications on Pekin and Tazewell history usually refer to Isaac as “Major Isaac Perkins.” Genealogical researchers of the Perkins family plausibly explain that he probably acquired that rank from an otherwise unknown tour of duty with the Illinois State Militia. Isaac’s only known military service, however, was as a Private in the Black Hawk War of 1832, when he served in the 5th Illinois Regiment Brigade of Mounted Volunteers under the command of Major Isaac Stillman and Major David Bailey. Stillman and his men, including Perkins, engaged Black Hawk’s forces on May 14, 1832, in the first battle of the Black Hawk War, known as the Battle of Sycamore, or better remembered as Stillman’s Run, which took place at a location about midway between Dixon and Rockford in Ogle County. Chapman tells the story of the battle on pages 258-261 of his 1879 history. Having unwittingly made camp near Black Hawk’s warriors, Stillman’s ill-trained and undisciplined men were immediately thrown into a panic and complete disarray, and the battle, such as it was, quickly became a chaotic retreat (hence the mocking name, “Stillman’s Run”). Black Hawk’s warriors easily slaughtered, scalped and beheaded the few soldiers who attempted to make a stand. Among them was Private Isaac Perkins. His youngest child, James, was then only three months old. Coming upon the gory scene the next day was a state militia brigade led by a 23-year-old captain named Abraham Lincoln, who with his men gathered the remains of the fallen and buried in a common grave at the battle site, near a creek that consequently was named Stillman’s Creek. In 1901, a monument was erected at the site, which today is at the east end of the town of Stillman Valley. In a previous column, we told of the popular horse race track and fair grounds that used to exist in the area where the Pekin Housing Authority residences are now located. 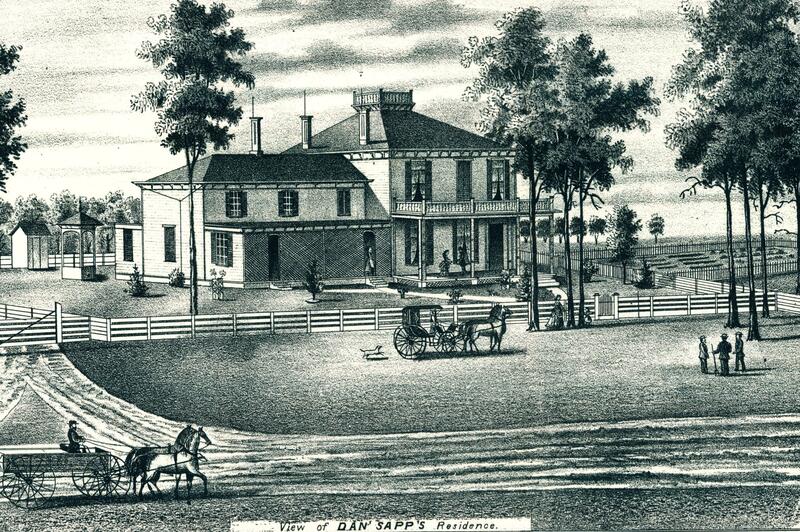 For much of its existence, the race track was owned and operated by a prominent local farmer, land owner and public official named Daniel Sapp, popularly known in the area as “Uncle Dan Sapp.” This week we’ll turn a spotlight on Sapp’s life and times. Three years after the publication of his biography, Sapp went on to run successfully for mayor of Pekin, serving a two-year term. He later ran again for mayor in 1905 and served a second two-year term. In memory of his service and achievements, Sapp Street in Pekin was named for him. No doubt one of the things that helped him achieve the success and prominence he enjoyed were her personal connections – he was related by marriage to the important Prettyman family of Pekin. Sapp was married twice, both times to members of the Prettyman family. His first wife was Elizabeth (Prettyman) Offutt, who passed away in 1887. He remarried in March 1893 to Nellie (Prettyman) Smith, who was his first wife’s niece – Nellie was one of the daughters of Pekin pioneer and attorney Benjamin S. Prettyman, who had held several public offices and had himself served a term as Pekin mayor. “Daniel Sapp, proprietor of the Spring Lake Stock Farm, and one of the successful stockmen of the Illinois Valley, was born in Fleming County, Ky., May 18, 1842. When a mere child he was left an orphan and thus thrown upon his own resources. At the age of fourteen years, in 1856, he accompanied a stock trader to Bloomington, Ill., where he worked on a stock farm at Randolph Grove for two years. As may be imagined, his school advantages were necessarily very meagre, and all the knowledge he now possesses has been practically acquired by self-culture. “The year 1858 witnessed the arrival of Mr. Sapp in Spring Lake Township, Tazewell County, where he assisted in breaking prairie and doing farm work, being for three years in the employ of one man, and receiving as compensation for his services forty acres of land in Peoria County. Of this property he was naturally quite proud, as it was the first he had ever owned and had been gained through his unaided exertions. In 1861 he entered the employ of the Memphis Ice Company and went south for them, having charge of the ice barges. He also attended to the unloading and sale of ice, and the securing of the collections. In May, 1861, when travel was especially dangerous on account of the war, he went south as far as the mouth of the Arkansas River with two barges, and on his return to Memphis Dr. Smith, of that place, gave him a letter to Gen. M. Pope, which secured his passage through the lines. He then returned to Spring Lake Township. “In 1863 Mr. Sapp was united in marriage with Mrs. Elizabeth (Prettyman) Offutt, a native of Delaware. After that event he settled on his present farm and engaged in raising grain and stock. From time to time he has added to his original purchase until his landed possessions now aggregate two thousand acres, for the most of which he paid $40 or $50 per acre. This farm is pleasantly situated on the Mackinaw River seven miles south of Pekin. Here he built a substantial residence, 72×36 feet in dimensions and two stories in height, which was the most elegant rural home in Tazewell County. Unfortunately the dwelling burned to the ground, but it was afterward replaced by another attractive and conveniently arranged house, a trifle smaller than the first. . . .
“After the death of his wife, in 1886 (sic – 1887), Mr. Sapp came to Pekin, and during the following year he purchased two hundred and thirty-two acres within the corporate limits of the city. Here he has a one-mile track, as fine as any in the state. The farm in itself is well improved with a barn, 100×36 feet in dimensions, with two wings 36×36 feet, and two large sheds outside. On the place are usually about one hundred horses. . . .
“In 1887 Mr. Sapp began breeding standard horses, commencing with ‘Billie Wilkes,’ which he still owns. . . . Mr. Sapp is one of the most extensive breeders of standard horses in central Illinois, and his reputation in that line is not limited to Pekin or Tazewell County, but extends throughout the state. Just two years after completing his second term as mayor of Pekin, Daniel Sapp died July 13, 1909. He is buried in Lakeside Cemetery, Pekin, where his second wife Nellie is also buried. His first wife, Elizabeth, is buried in the old Prettyman Burying Ground near the former site of Circleville. Here’s a chance to read again one of our old Local History Room columns, first published in September 2013 before the launch of this blog . . . In a recent Local History Room column, we reviewed the history of Green Valley, which is the largest community in Sand Prairie Township. However, as noted in that column, prior to the founding of Green Valley, the title of largest community in the township belonged to Circleville. If you do visit the Prettyman Burial Ground, don’t forget to wear your clod-stompers. Circleville is perhaps best remembered as the home of the Berry Gang, a group of horse thieves and cattle rustlers who committed numerous crimes in Tazewell County during the lawless and violent 1860s. The core of the gang were four brothers of the Berry family, William (“Bill”), Isaac (“Ike”), Emanuel (“Man”) and Simeon (“Sim”). The story of their crimes and how the law caught up with them, leading to Bill Berry’s lynching in Pekin on July 31, 1869, is told at length in the book “Lynch Law,” written by retired Pekin police officers Jim Conover and James Brecher. The book includes photographs taken around 1939 of two buildings of Circleville that were key locations in the story – McFarland’s Saloon, where the Berry gang plotted an ambush of the lawmen who were seeking to arrest then, and Ditmon’s Grocery and Tobacco across the street from the saloon. Both structures, which were on East Street (Circleville Road) are long gone, and even by 1939 had long been abandoned. What happened to Circleville that caused it to die? It could be that the bad reputation and painful memories from the Berry Gang days made it the sort of place where people preferred not to live and businessmen preferred not to invest money. Be that as it may, this pioneer prairie community thrived while it was on the old stage coach line, but during the golden age of railroads, communities that hoped to prosper needed a railroad. Being bypassed by the rail lines, in time Circleville dwindled and faded away. The layout of the streets and lots of old Circleville are shown in this plat map. The Prettyman Burial Ground is indicated by the cross at the bottom. Here’s a chance to read again one of our old Local History Room columns, first published in May 2013 before the launch of this blog . . . Recently this column took a brief look at the history of Creve Coeur, one of Pekin’s neighbors to the north, with the help of a published village history in the Local History Room collection of the Pekin Public Library. Green Valley is a small rural community in the south of Sand Prairie Township, not too far north of Malone Township. As a small rural community, its history naturally would not be limited to the families and events of the village, but would include the landowners and farmers in the surrounding area. Consequently, the quasquicentennial volume puts a spotlight not only on Green Valley, but also on Sand Prairie and Malone townships. Small though it is, Green Valley is the largest community in Sand Prairie Township. 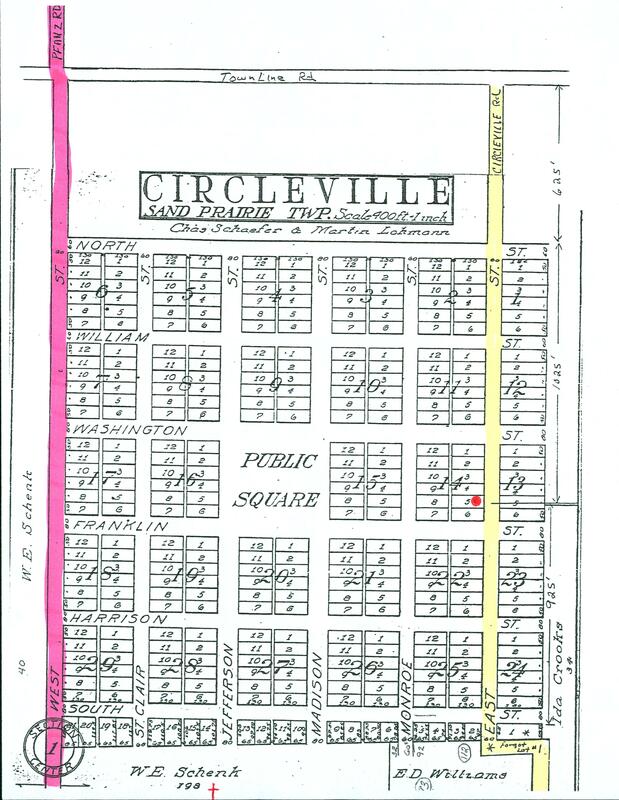 Prior to the beginning of Green Valley’s history, however, the title of largest community in the township was held by the vanished village of Circleville. Sand Prairie Township originally was called Jefferson Township, and it used to be larger than it is today, encompassing parts of what is now Malone Township. Around 1824 – the year Jonathan Tharp built his log cabin at the future site of Pekin – white settlers first came to the future site of Circleville, in Section 1 of the former Jefferson Township. Circleville later became notorious as the favored hangout of the Berry Gang, a group of outlaws led by four brothers, William, Isaac, Emanuel and Simeon Berry, who had a homestead just outside of Circleville. The criminal career and ultimate doom of the Berry Gang is told in “Lynch Law,” a book authored by local historians and retired law enforcement officers Jim Conover and James Brecher. An 1864 atlas map of Tazewell County shows Circleville in the northeast corner of Sand Prairie Township, but one will search in vain for Green Valley on that map. In 1864, the land that would become Green Valley was then the Dickson and Schureman farmsteads. (Other long-established and familiar family names of Sand Prairie Township include Woodrow, Deppert and Talbott. The wealthy Cummings family of Pekin also used to own land in the township.) 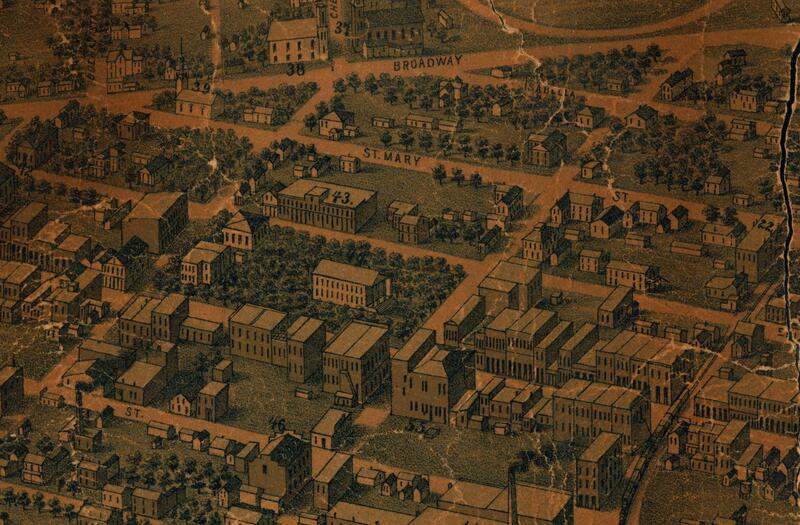 Nine years later, the 1873 atlas map of Sand Prairie shows both Circleville and Green Valley. But visitors to Sand Prairie Township today will find no trace of Circleville, which slowly dwindled away after the heyday of the Berry Gang. On Oct. 19, 1872, the unincorporated village of Green Valley was platted out by Samuel Schureman. The little settlement’s development was anchored by the Illinois Central Railroad, which was built in 1870, and the Smith-Hippen grain elevator, which was built in 1872. The village celebrated its centennial in 1972, commemorating the original platting by Samuel Schureman, but another centennial milestone is only three years away: March 11, 2016, will be exactly 100 years from the date Green Valley was incorporated as a village. The community formerly boasted its own newspaper, the Green Valley Banner, which was founded by Clark Nieukirk in the late 1890s and which continued to be printed until it fell victim to the Great Depression in the 1930s. Microfilms of the Green Valley Banner from July 15, 1897, to Dec. 28, 1922, are available in the Pekin Public Library’s Local History Room. Judging from the number of “likes” and “shares” on Facebook and Twitter, a great deal of interest was generated by the column last month on Pekin’s mysterious and ephemeral suburb of “Hong Kong,” marked on an 1857 wall map of Tazewell County but appearing on no other map nor in any other known historical document. Hong Kong, of course, is far from the only toponym that has vanished from the map. In April 1979, the late local historian Fred W. Soady Jr. prepared a “Preliminary Master List of Settlements in Tazewell County, Illinois” for the Tazewell County Genealogical & Historical Society. Soady’s list includes many place names that have long since disappeared, some of the settlements existing for a short time before dying out, others flourishing for a good while before succumbing to trends and pressures of migration and economics. The town of Circleville south of Pekin is a better known example of a town that was founded early in Tazewell County, flourished for many years (being on an old stage coach route), but later faded and died. In other cases, the places on Soady’s list are still inhabited today but were renamed at some point. As this column has discussed in the past, the old neighboring settlements of Fond du Lac (Fondulac) and Blue Town merged to become Hilton, which later was renamed East Peoria. Other nearby settlements we’ve discussed include Wesley City, which later adopted the name of Creve Coeur, while North Pekin formerly was called Radio City. As for the village of Mackinaw, which was Tazewell County’s first county seat, its original name was “Mackinawtown.” Soady’s list includes an entry for “MACKINAW TOWN” (two words), with a note saying, “oldest name (1827-28) for MACKINAW.” However, an old copy of a plat in the TCGHS archives, probably drawn during the 1850s from an original plat legally filed and recorded in the 1830s, shows the name as “Mackinawtown” (one word). The copy of the Mackinawtown plat, along with another copy of a plat for the “Town of Mackinaw” (made from an original plat filed May 26, 1830, with Tazewell County Recorder of Deeds Isaac Perkins) are among the old land records and plats in the TCGHS archival collection. One set of historical hand-drawn copies of Tazewell plats in the TCGHS collection was preserved by being interleaved long ago among the map plates of an old 1855 “Mitchell Universal Atlas” (published by Charles DeSilver) that was donated to the TCGHS in 1990. These plats, most of them drawn in the 1850s, are of towns and settlements with familiar names – such as Tremont, Delavan, Dillon, Groveland, Armington, Morton, Spring Lake, Hopedale, Washington – or else show additions to area towns, such as the Colts, Haines, and Cincinnati Additions to Pekin, or the Semples and Dorseys Additions to Washington, or Bacons Addition to Groveland. Several of these plats, however, are of settlements that no longer appear on our maps, or may never have appeared on any map or in any atlas or plat book. We have already mentioned Circleville, which no longer exists, and Wesley City, now called Creve Coeur. The Wesley City plat inserted in the “Mitchell Universal Atlas” is chiefly remarkable for showing a grid of streets and lots that is obviously and purely a fantasy of the plat owners, and is frankly impossible geographically, for the plat fails to account for Creve Coeur’s hills, gullies, and hollers. A number of these plats are of settlements that probably never got off the ground – “aborted towns” that never made it past the planning stage of the land speculators – or perhaps only existed for a short time, or later were merged into neighboring settlements. Among these “dead” and “aborted” towns of Tazewell County shown in this collection of plats are Liberty (surveyed July 22, 1835, plat filed June 17, 1836), Spring Garden (plat recorded by its proprietor S. A. Bumstead), Hancock (surveyed October 1836), Madison, Hamilton (surveyed August-September 1836), Cleveland (plat filed Feb. 15, 1836), Montpelier (surveyed Sept. 8-9, 1836), and Danforth (located along the old T & P railroad, surveyed by William S. Morgan for proprietors E. W. Cantwell and W. F. Evans). The town of Cleveland, on Peoria Lake, existed – or would have existed – about where East Peoria’s Walmart is located today. Soady’s preliminary list of Tazewell County toponyms suggests that Liberty may have been another name for Dillon, which, however, has its own plat in this collection separate from the Liberty plat. Soady’s list also suggests that Danforth may have been renamed Tullamore. But Spring Garden, Hancock, Madison, Cleveland, and Montpelier do not appear on Soady’s list. One of the “aborted” towns in this collection of plats was to be named Cincinnati. Like the proposed town of Cleveland, it was to bear an Ohio place name – many pioneer settlers of Tazewell County in general and Pekin in particular came from Ohio. The plat owners of the prospective town of Cincinnati were Jonathan Tharp and Jesse Dillon. Tharp is famous locally for settling in 1824 at a spot that is now the foot of Broadway in Pekin, where the former Franklin School now stands. The published works on Pekin’s history mention that two rival groups of Pekin settlers wished to establish a town here along the Illinois River. While one group, including Nathan Cromwell, Isaac Perkins, and William Haines, proposed a town with streets running perpendicular to and parallel with the river, Tharp and Dillon proposed their town with streets running north-south and east-west. Although the town of Cincinnati never came to fruition, “Cincinnati” is, of course, still an extant Tazewell County toponym – it’s the name of the township located to the south of Pekin Township. The photo gallery below features selections from the “Mitchell Universal Atlas” collection of plats, all images courtesy of the Tazewell County Genealogical & Historical Society. This plat of the “town” of Cincinnati, drawn and recorded in 1857, in fact shows Pekin’s Cincinnati Addition which had originally been planned as a separate town in 1830 by Pekin pioneer settlers Jonathan Tharp and Jesse Dillon.